Recall that few days ago, we reported here that a Nigerian has concluded plans to marry two of his fiancees. 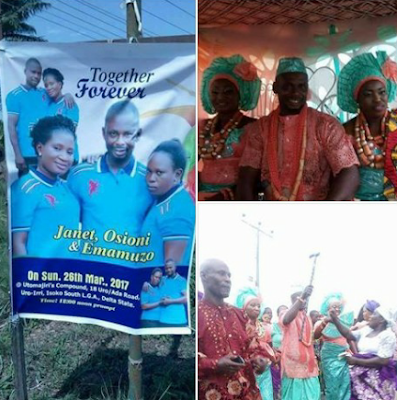 Here's a trending video footage from the wedding ceremony of the man, Emamuzo, who got married to two beautiful women Janet and Osioni in Isoko South, Delta State on Sunday. The wedding banner which featured him with the two ladies -sparked online debate after it emerged.